So when something is so right I have a tendency to procrastinate, admire, interview and just daydream about it rather than knit it. There is something wonderful about the feeling you get when you think about it...this feeling does not come often in life(or at least not for me)...absolute adoration...I like, enjoy and love alot....BUT adore no. The project you see being swatched(my adoration project) slowly evolved over the past month. It first started with the Madelintosh vintage arriving. I had all the yarn out on the table for customers to see and they did see them, lovingly picked them up and purchased them. I watched my color Chambray sitting there and then swooped up the whole lot of them and put them in my office. Never for the customer to see. Guilt? yes I felt plenty of it but not enough to put it out for others to see or share. Why tempt fate? 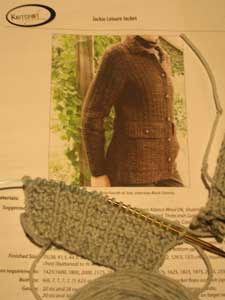 Early in the month we had a wonderful weekend retreat with Anne Hanson of Knitspot. To say we had a great time this weekend is an understatement. Anne shared a wonderful collection of knitted samples with us and we purchased patterns galore! There are so many different choices you have to visit her pattern shop. The patterns contain incredible detail and are well written, with charts, schematics and have been test knitted. Soooo, this all ties together because I became totally smitten with Anne's pattern the Jackie Leisure Jacket. Now remember my Madelintosh Chambray is hidden in the back room....no one knows it is there. I keep thinking about the color and would it just be too light for the Jackie Jacket? I finally can't stand it any longer and bring my yarn out from the backroom to ask for an opinion from Anne and Linda. It was funny to watch Anne's reaction(if you follow her blog she usually uses muted earth tones). She looks at the Chambray and thinks, frowns(and I'm thinking this is not good), thinks some more and then breaks into a huge grin. "It is perfect, think of it with winter white.....and then she starts chattering about how it will look and Linda joins her. The chatter continued into the start of the next day...they have picked out buttons and discussed this color way that presents a whole new look. Have I told you how smitten I am with this project?